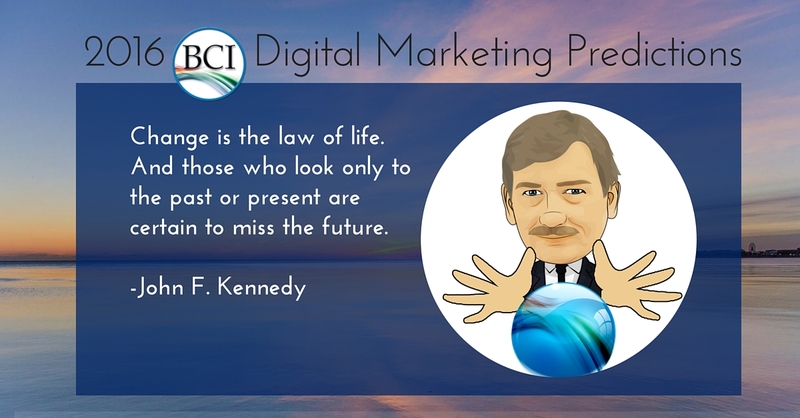 Bruce Clay is joined by Duane Forrester, David Szetela, Cindy Krum, Eric Enge, Larry Kim, Maddie Cary, Dan Petrovic, Richard Baxter, Marcus Tandler and Andre Alpar in sharing annual digital marketing industry predictions. Where to start? Right here. 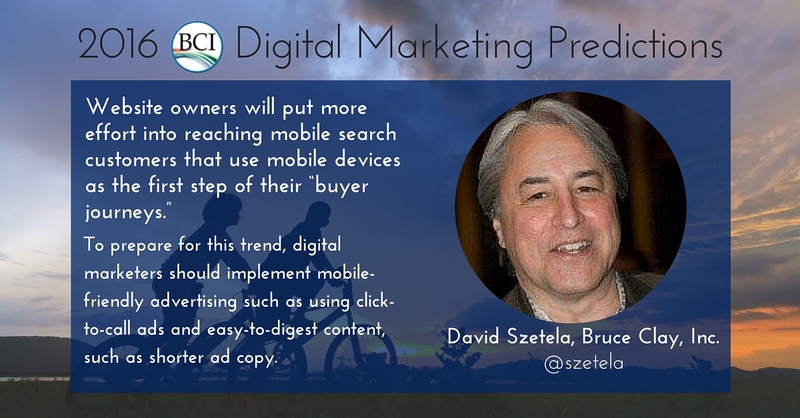 Bruce Clay, Duane Forrester, David Szetela, and invited digital marketing rockstars have shared their 2016 predictions for the online marketing industry. What will you do with this foresight into the year ahead? Duane Forrester – HTTPS, podcasts and search from Facebook and Amazon make an appearance in this former Microsofties predictions. David Szetela – Facebook, Instagram and Bing display are big winners in the “Pay-Per-Click Marketing: An Hour a Day” author’s picks, but read to find out who he bets against. Cindy Krum – With mobile changing everything about digital marketing, you’ll want to read this mobile tech expert’s take on 2016. Eric Enge – SEO scientist and co-author of “The Art of SEO” sees machine learning, personal assistants and wearables in the future, but whether going up and down, you’ll have to read to find out. 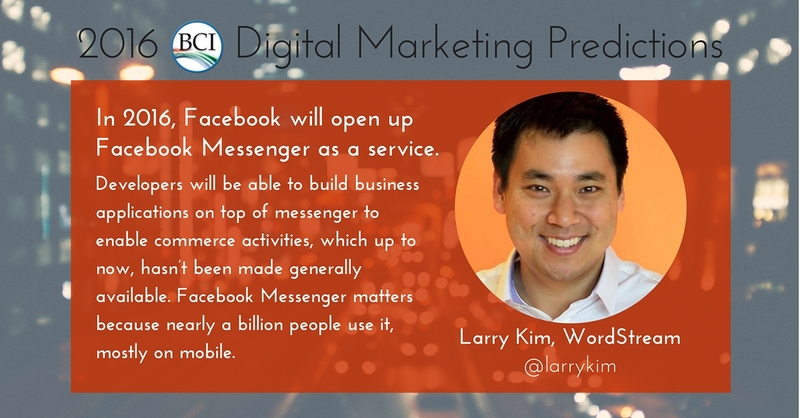 Larry Kim – What will be the biggest game changer this year according to the 2015 Search Personality of the Year Award winner? Hint: It starts with F and ends with R … ? 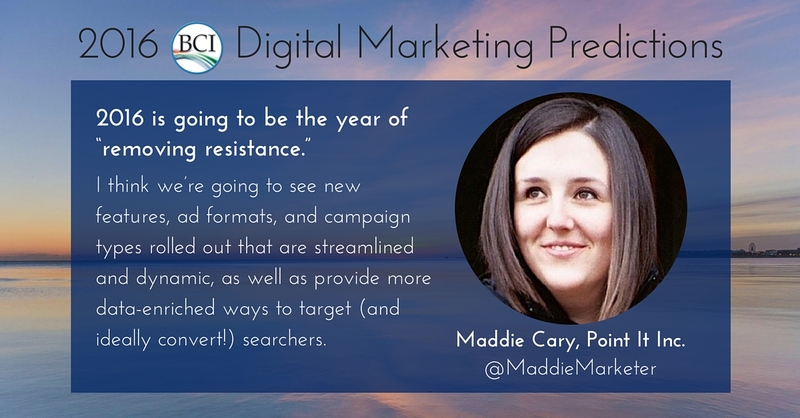 Maddie Cary – U.S. Search Awards 2015 Young Search Professional of the Year dubs 2016 the year of removing resistance with PPC predictions to back it up. Dan Petrovic – The international SEO’s predictions echo a familiar theme — content quality — backed by some interesting new research out of Australia. 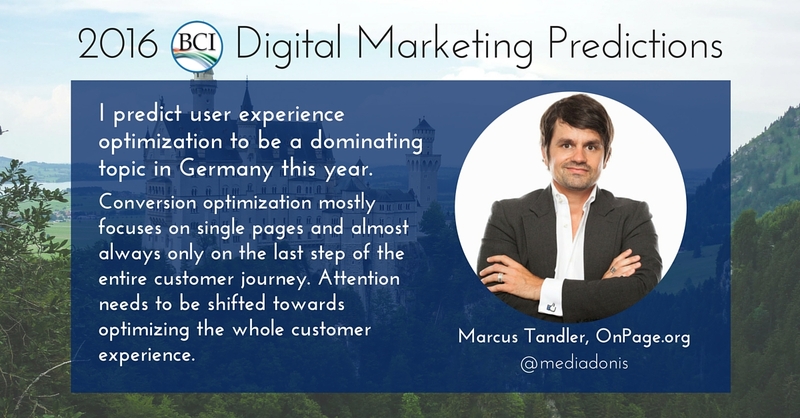 Marcus Tandler – User experience is Tandler’s hot topic in Germany, with conversion optimization cooling off — read why. 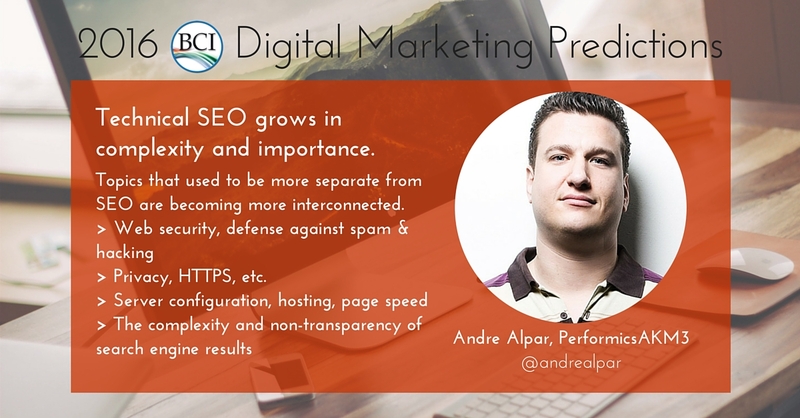 Andre Alpar – The Berlin-based SEO’s predictions offer a helpful rule of thumb to multi-language businesses who must weigh the ROI potential of content in multiple languages. (+BruceClay) President, Bruce Clay, Inc.
1. Mobile devices will surprise everyone with new wireless “attachments” rivaling the power of desktops, and by 4Q we will see an accelerated mobile use in the USA. Until then it will continue to grow but not at the rate most expect. PC share will shrink as tablet and mobile dominate the space for quick information and location specific queries. 2. Google revenues will grow exponentially as they continue to place ads above organic results. For some queries there will be 4 or fewer organic results well below the fold. Bruce Clay’s 2016 #SEO prediction: For some queries there will be 4 or fewer organic results well below the fold. 3. Google will emphasize local results for all queries. Local will allow Google PPC prices to increase as merchants will no longer appear outside of their specific region and are forced to purchase ads. 4. Apps that load web content will be the rage. This allows users to have a favorite app, yet get the power of a website. Most users will find that “mobile friendly” is simply not enough. 5. Millennials will be influencing a massive web design surge. 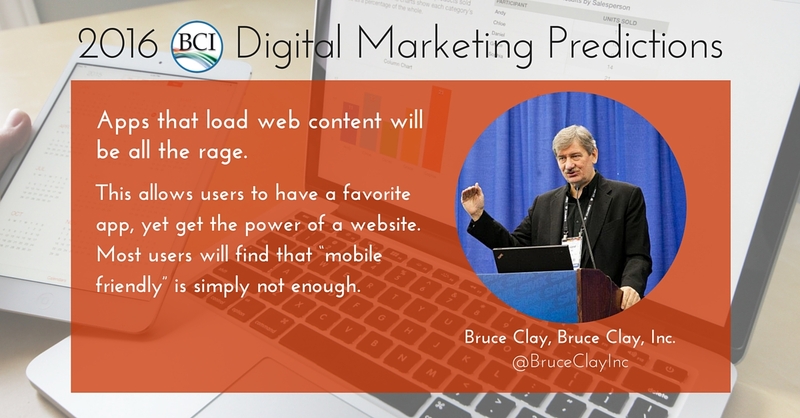 Bruce Clay’s 2016 SEO prediction: Millennials influence a web design surge, challenging #SEO with influx of dynamic content. 6. We will see the demise of link building as a prime influence in SEO. Link building will be replaced by on-page technical quality, amazing content, mobile friendly, peak performing pages. If the link is inappropriate Google will just ignore it. 7. Internet marketing becomes Internet advertising in order to survive. The web ceases to be a gold rush, evolving into a pay-to-play space. The few sites gaining true organic rankings and holding them will be gold. The rest will buy ads. (@duaneforrester) VP, Organic Search Operations, Bruce Clay, Inc.
8. HTTPS will be much talked about in 2016 but little action will be seen with relatively few sites making the swap. Security will remain a hot topic as consumers wake up to the ongoing data-theft problem, but businesses will be slow to make changes due to the inherent costs involved. 9. Mobile will continue to see growth. Microsoft’s move with Windows 10 on a mobile device that can act like a larger computer/environment will see some traction for light-duty users. “Indestructible” and “waterproof” will be bigger marketing angles, so expect to see “tougher” versions of phones released, likely tied to some cool photographic features aimed at the vacation/adventure crowd. 10. Podcasts will see continued growth in popularity due to their ease of production/consumption. 2016 digital marketing prediction by @duaneforrester: Podcast consumption will grow & AI will be a hot search topic. 11. AI (artificial intelligence) will be a much hotter topic across search in 2016. This will mostly be driven by a detailed lack of understanding of what level of AI is in play within systems like RankBrain. Overall, more folks will gain understanding of the three levels of AI, deepening our understanding of what we see in SERPs. All AI are not created equally, so expect some companies to claim to be using it, even though the first level isn’t very advanced. And the third level (human-like) has yet to be attained and employed in a meaningful, public way. Expect to see this level gain more traction in 2016, but, ah…we better be ready! 12. Facebook and Amazon will launch actual search engines. Well, maybe. Don’t they already have these? OK, this prediction is that in 2016 both of these rumors will pop to the top again, whether they are factual or not. 13. Bing will continue to grow while Google starts to see more leveling off. 14. Yahoo will get out of search. 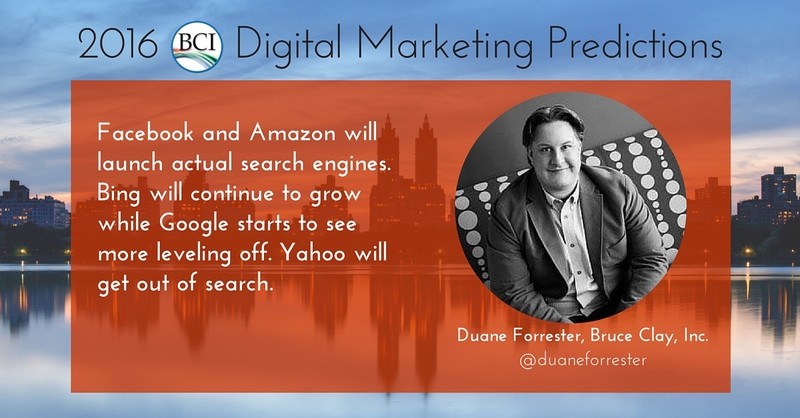 2016 #SEO prediction by @duaneforrester: Bing will grow, Google will level, Yahoo will exit search. 15. Round-ups will finally, thankfully, retire. But the spam from random people will continue. (@szetela) VP, Search Marketing Operations, Bruce Clay, Inc.
As a result, apps, built-for-mobile sites, and responsive websites will take off. To prepare for this trend, digital marketers should implement mobile-friendly advertising such as using click-to-call ads and easy-to-digest content, such as shorter ad copy. 17. Advertisers will invest more money into Facebook and Instagram. Facebook will become a viable direct response platform and advertisers will take advantage of its latest features, including retargeting, dynamic product ads, and custom audiences. 18. 2016 will be the year Bing Ads search and display traffic will be seen by more advertisers as a viable platform. Bing Ads will finally have its own display advertising network capable of reaching target audiences based on behavior data from Windows 10 users and other search partners. This will be fueled by the fact that the growing click inventory will be cheaper than Google CPCs. But take note: cheaper prices won’t last long, so make sure to purchase your fair share of Bing Ads while you still can. 19. 2016 looks grim for Yahoo/Gemini. Direct response advertisers will stay away and digital advertisers will continue to see it as a second best option for native advertising. 20. PPC will be broken down into specific areas of expertise. As ad platform products and features continue to develop and launch at a fast pace, individual PPC managers will have an even harder time keeping up with all aspects of PPC in 2016. Agencies will hire team members that specialize in those areas to act as resources for the rest of the agency. 21. I feel strongly that we are going to start to see more ChromeCast logos in Google properties — potentially directly in the SERPS. 22. Getting exposure in the ChromeCast app may become relevant for SEO. ChromeCast automatically scrapes the Deep Linked video and music apps on your phone for content that it can aggregate, so you only have to go one place to see what’s on. Also, it seem seems very likely that video and audio content will eventually receive a rankings boost if they are integrated with ChromeCast, since Deep Linking is starting to be more seamless on iOS, and more prevalent on Android. 23. App Streaming may be the way of the future – especially for entertainment apps like Netflix, Amazon Video, Hulu, Pandora, Spotify, etc, which already really work best on WiFi. Why download the app when it is available from the cloud without wasting storage space on your phone? Streaming apps will hopefully make the app/web distinction less relevant, and save some developers from having to build/maintain both Android and iOS apps (finally!). Apps that can be easily streamed may consequently eventually be given an additional rankings boost. 24. App plugins will become more important. 25. I anticipate a consolidation in some Google properties. I am not sure which way things will go, but Google Play, Google Music, YouTube, Google+ all seem to have some overlapping capabilities, and are sharing lots of data. Google is also really struggling with UX for people who have multiple Google accounts – I can only hope that they find a good way to manage that, so that all the services will work better together. 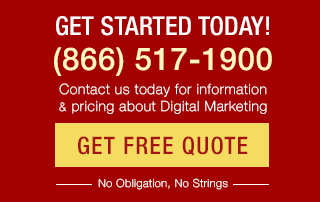 2016 will be a huge year in digital marketing, as there is so much going on. Here are some of my predictions. 26. 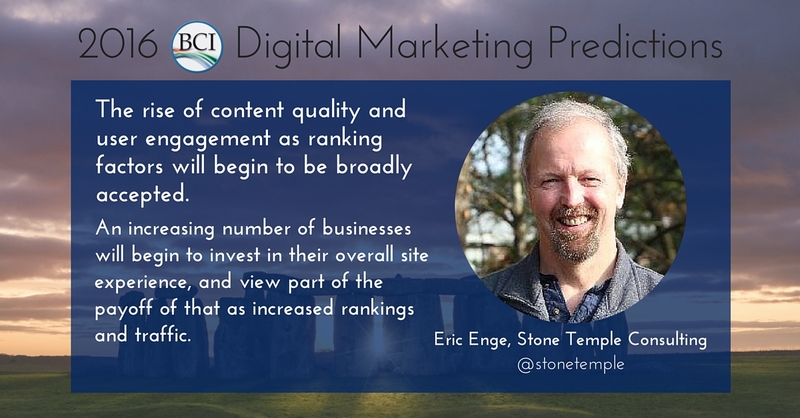 The rise of content quality and user engagement as ranking factors will begin to be broadly accepted. An increasing number of businesses will begin to invest in their overall site experience, and view part of the payoff of that as increased rankings and traffic. More and more SEO agencies will correspondingly promote related services on their sites as a result. 27. The power of paid social as tool to drive content marketing campaigns will also become more mainstream. Currently, only a small subset of the industry recognizes this, but the word will get out. This will cause more content marketing agencies (or SEO agencies) to offer paid social services. 28. Wearables will show a disappointing level of growth. People will realize that they don’t find the functionality that compelling yet. 2016 prediction by @stonetemple: Wearables will show a disappointing level of growth. 29. Personal assistants from Google, Apple and Microsoft will continue to battle through the year. As these companies view those platforms as one of the most important land grab battles for the future of digital marketing. This will result in major new announcements from at least 2 of the 3 aforementioned parties this year. 30. Machine learning will become more mainstream as well. The computing knowledge needed to implement these algorithms is become much more accessible, and the power of machine optimized algorithms is undeniable. 31. In 2016, Facebook will open up Facebook Messenger as a service. Meaning, developers will be able to build business applications on top of messenger to enable commerce activities, which up to now, hasn’t been made generally available. For example, say you’re doing a group chat in messenger, you could order an Uber for a friend, and they could see your status in real time. Or say you’re an ecommerce company — your customers could subscribe to a live update of the shipping, and do future orders by just replying to message. Facebook Messenger matters because nearly a billion people use it, mostly on mobile. Filling out those complicated ecommerce forms that were designed for desktops is so much harder than texting an emoji or using voice input. To say this is disruptive and transformative to mobile commerce is an understatement. What’s a marketer to do about this trend? A simple growth hack would be to start supporting Facebook logins on your site or apps, and collecting Facebook login IDs and/or mobile phone numbers as part of your direct response marketing efforts, so that you can target them later. (@MaddieMarketer) Senior Client Manager, Point It Inc.
How many articles and studies have we seen over the last 1-2 years showing how mobile search volume is surpassing desktop? Yet why is it that it’s still difficult in many verticals to convert mobile searchers? I anticipate we’ll see search publishers take the Amazon route and start rolling out one-click options on the mobile SERP (like that Google mobile buy button) in order to shorten the conversion path and improve conversion rates, encouraging more PPC investment in mobile. How else do you shorten the path to conversion? By showing the searcher what they’ve already expressed an interest in. Dynamic ad formats & targeting methods are going to expand further in 2016, and I think we’re going to get more ad building tools within the UIs to help further streamline that process for online marketers. SERPs are getting more visual, and therefore I think PLAs are the frontrunners for driving e-commerce growth through 2016. If you then start to imagine Shopping campaigns that incorporate layered audience targeting + mobile one-click buy solutions + dynamic ad formats…that could be the winning formula for notable PPC channel growth throughout this next year! Content production has been increasing at a phenomenal rate. The abundance of choice and easy of access of web content lead to changes in our reading habits. One specific phenomenon is the rise of skimmers. The majority of our respondents admitted to skipping uninteresting parts when reading content or even only quickly scanning pages looking for quick answers. We’ve known this for nearly two decades yet few are getting their content format right. 2016 #SEO prediction by Dan Petrovic: Producing lots of “OK” content isn’t going to cut it in 2016. 36. Producing lots of “OK” content isn’t going to cut it in 2016. I believe we’ll see a lot of digital agencies adjusting their approach to content formats and keeping in mind that more doesn’t mean better. I’d like to see Google reward innovation when it brings good user engagement signals. It’s time for them to start treating content behind tabs, accordions and other mechanisms for what they are designed for — great user experience. Penguin release will be mild and uninteresting. Google will continue to aggressively push mobile. Additional incentives will be offered to switch to https. We’ll start seeing a smarter AI-based results, but will not be impressed. New developments will be made on a personal assistant level involving two elements: email and voice input. 37. The demand for technical search expertise will increase significantly, especially in mobile. Over the past 6 months we’ve seen a lot of development in the mobile influenced side of search. App indexing is now a standard part of most technical search audit recommendations, and as we progress into 2016 I’d expect to see more app only content in search results. This will include app streaming — enabling the use of an app without it actually being installed on your device. Put simply, the number of options available to marketers to drive traffic from mobile will expand, but will all require a great deal of technical discipline to get right. Over the longer term, we’re going to see the divide between desktop and mobile channel tactics expand. 38. SEO software companies are in for a transformative period. The majority of the reporting and tracking tools we use today are going to need to provide a step change in their products to cope with mobile, mobile search results tracking, app traffic, traffic modelling and research. More emphasis on placement, channel, device, topic and targeting will be required by content marketers to provide more relevant content experiences to an oft content fatigued audience. We’ve observed a large increase in examples of quite complex content production coming out of search marketing agencies, to the point where the ability to provide interactive content is no longer a USP. 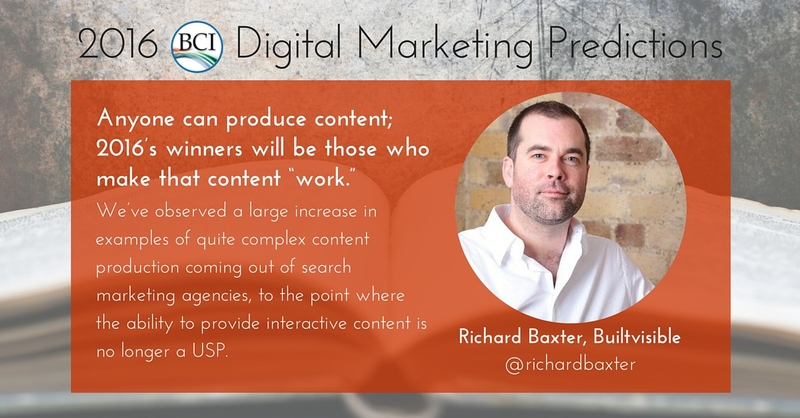 For our industry, I think 2016 will be a year of focused attention on what makes content “work”. This is a huge subject that doesn’t receive the coverage it deserves, and hopefully we’ll see the subject covered in more detail at this year’s search conferences. 40. I predict user experience optimization to be a dominating topic in Germany this year. 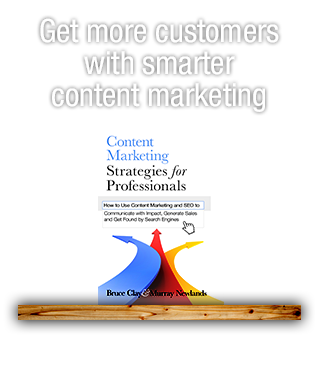 By now conversion optimization is an established tactic and within the standard repertoire of clever in-house online marketers and performance marketing agencies alike. Unfortunately, conversion optimization mostly focuses on single pages and almost always only on the last step of the entire customer journey. Attention needs to be shifted towards optimizing the whole customer experience. This does not only include the optimization of the entire customer journey but most importantly optimizing all touch points potential customers are having with the brand, including any social media platforms, as well as traditional marketing activity whatsoever. Personalization is key here, to enhance the brand experience and general user experience. Nowadays users expect a personal and individual attention — relevant content, at the right time via the right channel. No widely spread advertisement but rather authentic dialogue. 41. Technical SEO grows in complexity and importance. Technical SEO will definitely require investment in terms of effort and costs. It remains to be a potentially great differentiating factor for those able to adapt quickly while managing effort thanks to a sound technical infrastructure. 42. Links will still matter. It seems during the last three or four years that some search marketers have adapted “links are not important any more” as their version of the claim, “SEO is dead”. All search marketers who realistically can grow their own and their clients’ organic traffic over many years know that this false prediction is far off and will stay so for at least another five years. Sure, there may be other off-page signals that can complement links e.g. the analysis of traffic via browsers, but at the moment, and for the foreseeable future, there is no better off-page quality signal than a good link that drives direct traffic—and, ultimately, a large multiplicative of traffic via better positions in SERPs. 43. Drifting apart of content quality requirements. This may be a trend that many do not see but we are confronted with it daily as we work in many multilingual and international setups in Europe. Investments per piece of content in large countries, or languages which are spoken in many countries, are growing rapidly. But this is not the case for smaller countries or less popular languages. Think, for example, of the many European countries with less than 10 million inhabitants and their own local language. 2016 international #SEO prediction by @andrealpar: Business will invest in content, prioritizing development by language populace. Also think of the varying search terms and topics. Where it makes sense to invest a lot in content in, for example, English, Spanish or German, it makes less sense to do so in Italian or Dutch, for example, and even less in Serbian, Danish or Swedish. 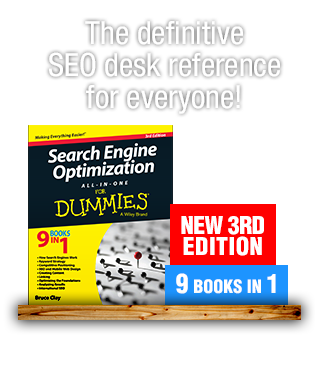 You have to then also find and adapt how you measure SEO success or ROI on content, etc. The aftermath coming out of this development has a massive strategic impact. For multiregional and multinational companies and the agencies that they work with, this is a huge and massively growing driver of the complexity of SEO. Thank you all for sharing your predictions with us here. If you reading have predictions, comment away. We’ll be checking back with our assembled experts through the year to see how their predictions stand. Liked this post? Subscribe for updates! Sign up to get the latest search engine marketing and optimization news from Bruce Clay, Inc. delivered to your inbox monthly. Simply enter your email address to stay in touch. Really informative article. Digital Marketing is surely becoming an integral part of SEO in 2016. Social Media signals from important social media sites including Facebook, Twitter and especially Google Plus are really an important SEO signals which no search engine can afford to ignore. Thanks, Ed! I just compiled the article. I have a dozen true visionaries to thank for the predictions. Wow Virginia, this is an incredible article. You could have charged money for it. I loved all the expert insight. Thank you very much for the time, effort and attention to detail you put into this article. Great post, Virginia!Wow! Your blog is very unique in every way, the tips and information in this article is great and reliable. Today’s Internet Marketing boom in all over the world. Its really amazing and helpful article, that makes the business people aware of the trending digital marketing technique for the upcoming year. Some of them are obvious choices. On the other hand, some of these predictions seem like wild speculations. Nevertheless, the best thing we can do at this point is guess. I hope that Google will not limit its results to local websites. In the end, internet is a global network which should relay information from all over the world. This way, if there is some interesting discovery in China or Brasil, we should get quick access to it. Hopefully, adds will not play such an important role. Great post, Virginia! Thank you for sharing. Hi Bryan — I think you’re absolutely right that different regions my have algorithms that weight mobile friendliness heavier due to how users are accessing the web. Are you located in South Africa? Along with South Africa, I’ve learned that much of Asia is in the same boat with being the main means for going online. You observe some true irony, regarding GA referrer spam and Google’s spam standards. I’m optimistic GA gets that ghost referrer problem sorted soon — it’s pretty ridiculous. Hello, My first visit to your site, I have found your blog on the top seo blog list. Really good blog. By the way, I am lutfar just my new seo and marketing blog. I am a newbie and just learning ! thanks for your great post ! Some great SEO and mobile predictions. Mobile will continue to play a huge roll, but I do feel that some of the indicators are regional. In South Africa where mobile growth is substantial it may carry a greater weight in SEO than other countries where mobile is not as big. As my own prediction, I think that video will play a larger role in 2016, creating great content with a video uploaded to Youtube around the same topic (like a how to) is going to be considered valuable. Do you really think links will go away in the near future? Thanks.Its very helpful article .where you guys have covered all the points in your prediction ..these are not very specific but its really good to look over .. I agrees with the prediction of Andre Alphard, CEO, Performics AM3 Berlin. I will improve my website and hope it can improve rankings in the future. However, it is still a mystery for SEO in the future. Hi Mike! I don’t see any predictions that are as shallow as that. In fact, Bruce has a mobile-related prediction that is rather specific: “Mobile devices will surprise everyone with new wireless “attachments” rivaling the power of desktops.” Wireless attachments? What that looks like is open to guesses and interpretation. 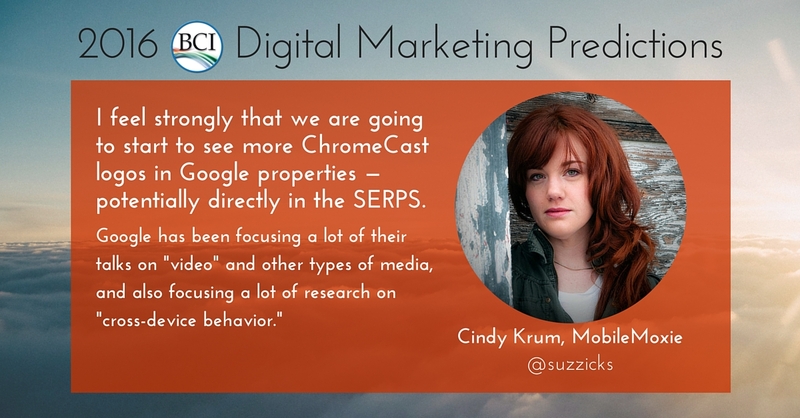 Cindy’s mobile predictions bring in tech that people really aren’t talking about today: ChromeCast and its possible influence on SEO rankings. I could go on. Growth of mobile is a given, but I’m rather impressed in intrigued by the specific details and directions that are portended. Its really amazing and helpful article, that makes the business people aware of the trending digital marketing technique for the upcoming year.